Celebrated photographer, photojournalist, and documentary filmmaker, Raymond Depardon was born in Villefranche-sur-Saône, France on July 6, 1942. His interest in photography began when he started taking pictures of his family’s farm at the age of 12. 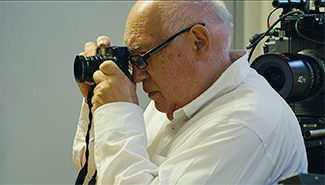 A prolific artist, Raymond Depardon has so far directed 20 feature-length films and published over 50 books. In 1966, Depardon co-founded Gamma, a photojournalism agency and then became its director in 1973. In 1977, he received a Pulitzer Prize for his photographs of conflict zones in Chad. In 1979, he became a full member of the international photography cooperative, Magnum. In 2012, he took the official portrait of French President François Hollande. In terms of filmmaking, Depardon’s style is influenced by the raw, unnarrated approach of cinéma vérité and direct cinema. Both Reporters (1981) and New York, N.Y. (1986) won the César Award for best short documentary. La Captive du Désert (1990) was nominated for the Palme d'Or at the Cannes Film Festival. His 1994 film Délits Flagrants won best feature documentary at the César Awards, International Documentary Film Festival Amsterdam (IDFA), and Vancouver International Film Festival. In 2000, the Kraków Film Festival honored Depardon with the Dragon of Dragons Lifetime Achievement Award. 12 Days - Every year in France, 92,000 people are placed under psychiatric care without their consent. 12 Days focuses on those who have been involuntarily remanded to a mental hospital and documents the hearings that, according to a 2013 law, are required to take place 12 days after each patient has been committed. Journal de France - Travelling alone, Raymond Depardon spends six years revisiting important places from his past as a reporter. After coming back from Chad, Venice, Cannes, and other regions, Depardon and his long-time partner and collaborator, Claudine Nougaret, create a remarkable travel journal with extraordinary glimpses of private and public life. France (Les Habitants) - Raymond Depardon travels through provincial France in a camper, gathering conversations with people from all walks of life. Tender, powerful, and at times funny, this is a film that reveals the country’s intimate side.